Today we are celebrating KianShen's birthday at Restoran Ajimal Razim, Sri Petaling. For some people, birthdays are celebrated with luxuries, but for this bunch of the Serayans, the luxuries are the times they have shared together since 13 years old. How many people are still close with secondary school friends? Well, Kianshen birthday is always interesting because there's a tradition of passing the gifts. 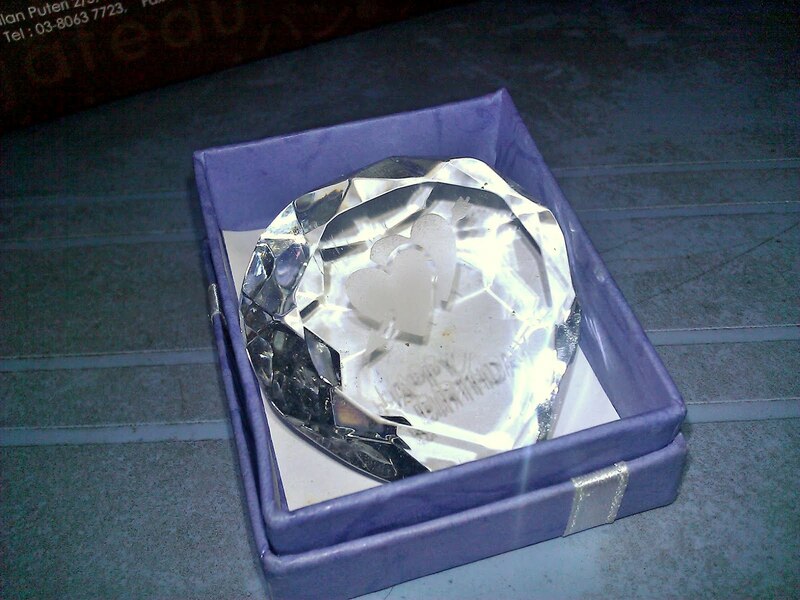 The crystal above has been passed on between Kianshen and JS for 10years already! Who would have imagined a RM4.90 childhood bromance gift brings such significant meaning? A gift tradition that initially started as a joke became something that bond friends together. Do you have any tradition with your friends? Mind sharing??? Ken, FOOD treats are usually for lazy people who lazy to think of what gifts to buy. Thristhan, haha ya wor! Banyak carrat! Break Up! Bosco and Myolie No Longer Together! I'm So Hungry I Would Eat A CONDOM!!!!! The Dark Knight Rises To Cinema Today! Why Do We Love To Smell Our Pillow? ?